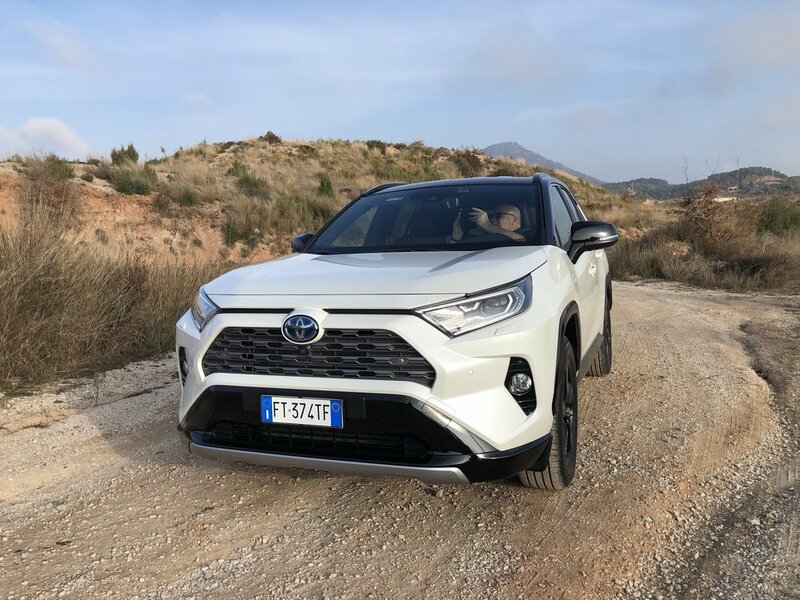 Alan trotted off to Spain with Toyota to try the new, fifth-generation RAV-4. There will be a full podcast shortly, but in the meantime, here’s our 150 second summary. Toyota has launched a new RAV-4 to fit between the space-age CH-R and the perennial Land Cruiser. The fifth generation is brand new and follows Chairman Toyoda-san’s diktat of “No More Boring Cars”. Externally, the new model is a smidge shorter, a smidge lower and a smidge wider than before and the styling is more an evolution of the angular Mk2 and Mk3 cars than its immediate predecessor. It follows the current “Angry Android” fashion for design, but the more you look at it, the more handsome it becomes. Inside, the rear is 40mm wider than before and the boot space is massive - over a metre deep at floor level. The back seats have plenty of space and occupants are treated to reclining backrests, fresh air vents and a pair of USB ports. Up front, the cabin is dominated by a tall centre console and low driving position making it feel snug, sporty and premium. Buttons on the dashboard are large and all the knobs have a tactile rubber outer like a model car tyre. The 8 inch screen atop the dashboard is neatly integrated and on almost all models include navigation. Visibility is good with large mirrors and even quarter lights in the doors to lessen pillar intrusion. Power comes from a 2.4 litre petrol engine paired to at least one electric motor and a CVT to give 215 horsepower in 2wd models and 219 for the AWD. 0-62mph takes 8.4 and 8.1 seconds respectively. On road handling is good for a 2.2 tonne vehicle not tuned to be overtly sporty. The ride is comfortable , even on challenging roads, and pitch and roll are kept in check. There are four drive modes available on all models: Normal, Eco, EV and Sport. AWD models also dd a Trail mode for off-piste adventure. Off-road, the AWD model could have coped with a much harder test than the slippery track Toyota provided at the launch. 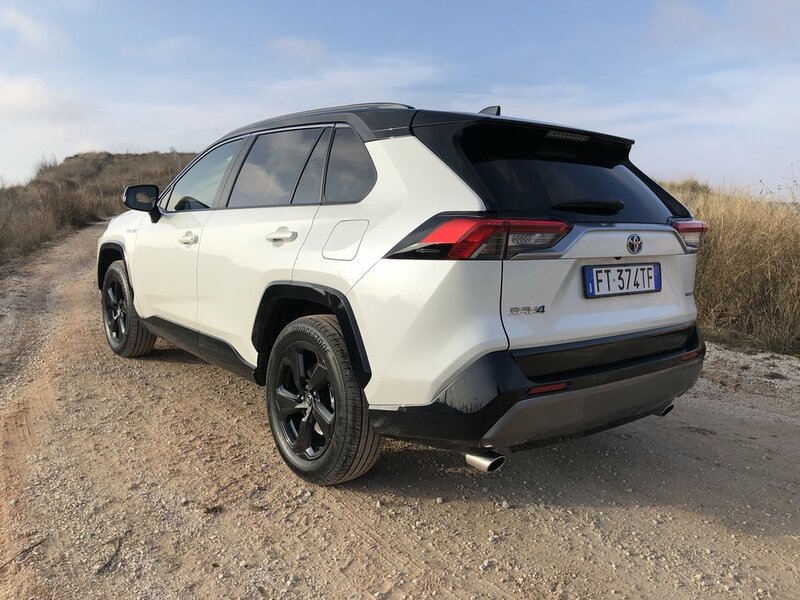 Equipment is good in all 4 launch trim levels with reverse sensors and cameras, electric folding mirrors, privacy glass and Toyota Safety Sense 2, which includes all the all the avoidance tech you could want plus adaptive cruise, as standard on all cars. The base Icon is 2wd only, but all other models can be had as AWD too. The 5th generation RAV-4 is a step-change over the outgoing model and brings it right up to date. The RAV-4 is spacious, comfortable, economical and available for about £300/month. There’s no reason this can’t be all the car you’d ever reasonably need.